Squirrel is the most excellent planner, saver and organizer, he brings great animal medicine for those who have problems knowing how to prepare for the future, or even for a big event. Squirrel also loves a bargain and knows where to find it, he knows the houses that have the goods he wants overflowing in gardens and patios, and he will find a way into your heart as well as your garden. Over time, Squirrel develops trusting bonds with those who leave him what he desires the most; bowls of nuts and seeds. He will scamper onto a patio spying the spot where the nuts are put out for him, and if he sees you and the bowl is empty, he will wait as patiently as he can, and if he thinks you've forgotten he will find a way to capture your attention, in hopes that you will soon deliver what he dropped in for. In return he delights these friends with his charming ways... knowing glances, swishes of the tail and a bit of chatter. The more he gets to know you the longer he stays and visits with you, and after a time he may let you come close enough to place a nut right in front of him. 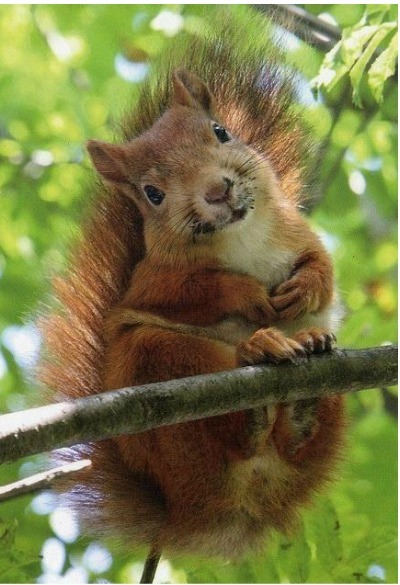 You will feel a special kinship with your Squirrel friend... Squirrel spirit animal reminds you that in order for friendships to grow, trust must be gained, and from there sweet and unique friendships arise. With Squirrels natural charm he is the ideal teacher of the idea that a little charm goes a long way in getting what you want, and people like to business with people they like. As much as the Squirrel symbolism represents planning, saving and stockpiling, the Squirrel is a natural street charmer and entertainer. High above the street, sometimes several stories up the Squirrel dazzles on the high wire, seemingly without a thought to the danger and perils of his high wire adventures he scampers, dances and prances his way to fulfill a secret mission. His mission... to gather as many delectable nuts and seeds as he can possibly find in a day. Squirrel is the quintessential treasure hunter! He knows what he needs and he is ever ambitious in his commitment to fulfill his vision of stockpiles of food to enjoy through the winter months, in fact the Squirrel has so many caches and pantries hidden about his home territory he forgets where many of them even are. If you have Squirrel as your power animal, you enjoy keeping a well stocked pantry, knowing that all of your supplies are at hand, and you know the importance of saving for a rainy day. Squirrel is a bit flirty too, he comes by chats you up for a moment and then scampers away... scurrying across the lawn - up the tree - swishing his tail in the most fanciful way. And to your surprise after a spell, he appears once more on your patio looking to and fro, and the whole routine begins again. All the while you wonder, how can he fit so many nuts in those tiny little cheeks! Squirrel makes his home high in the tree in a little hollow. Squirrel enjoys the safety and security of a cozy spot all his own up in the tree. This is his sanctuary, a little piece of heaven... snug, safe and sound. If you like climbing trees and tree houses, Squirrel is most definitely a spirit animal knocking at the door of your heart. The tail of the Squirrel is filled with subtle energies and messages, and it stores secrets and inner feelings. But as the Squirrel swishes his tail he reveals glimpses of his innermost secrets, just as you reveal your true feelings when and if you wear your heart on your sleeve for all to see. The many secrets of the Squirrel adds to its mystique and delight. Squirrel is a very active spirit animal, always on the go, out and about... dropping in frequently on all his favorite haunts spreading sunshine and happiness wherever he goes. Legend has it that fairies adore Squirrel. When you dream of the Squirrel is it a magical encounter? Here are some clues! Squirrels and fairies love to romp and play together in the forests and the glens, it is a fact that fairies can be spied riding atop the Squirrel in races and all sorts of daring obstacle courses. Squirrel can come to you in your dreams to nudge you to connect to the playful spirit within, and to seek the magic that is all around us. Dreaming of Squirrel can also be a sign that you need to consider your resources and make sure you have adequate supplies and savings set aside. 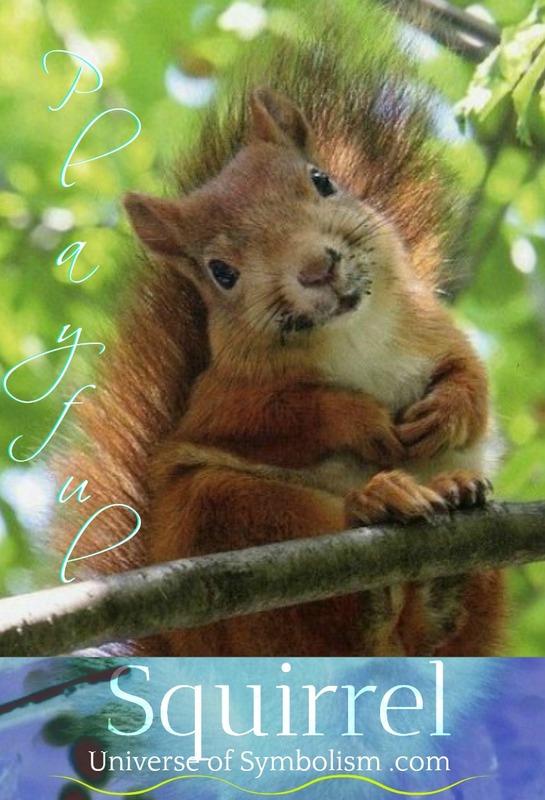 Call on Squirrel when you've been cooped up and need to drop in to the places that bring joy to your heart. Take Squirrel with you to the grocery store, and let him help you organize your pantry or next party ~ big or small. Squirrel will help keep you focused on all of the little details so you can enjoy time with your friends, the way you enjoy your visits from Squirrel power animal. For extra goodness, prepare "doggy bags" filled with sweet treats to honor and bless your guests and inspire them to remember your shindig with gorgeous sweet memories, just as the Squirrel does.